After Philip Sutton’s wonderful exhibition we are delighted to continue to offer a number of his paintings for purchase and can arrange viewings by appointment. Pictures can be viewed further down this page. To enquire about any of his paintings please email gallery@sladersyard.co.uk or telephone us on 01308 459511. In 2014 Philip Sutton and his wife Heather moved back to Dorset, where he was born. Very sadly Heather died earlier this summer after 56 years of marriage. Philip continues to paint every day. Flowers, still lives, portraits and self-portraits in oils and charcoal are as full of poetry and his unique vision as ever. His show included new work alongside other pivotal pieces in Sladers Yard gallery, a historic working building that lends itself to Philip’s vibrant joyful work. He is excited by the space and its proximity to the sea which he has always loved and painted. Born in Poole on 20th October 1928, the youngest of four boys Philip Sutton left school at 14 and worked for three years in a drawing office, waiting for the lunch break so that he could borrow a drawing board and draw. After national service in the RAF, during the Berlin airlift, a grant allowed him to study at the Slade from 1948 – 53. His contemporaries included Craigie Aitchison, Euan Uglow and Michael Andrews. Philip Sutton admired their work but was quite unlike any of them. He found his own style, struck by the mixture of playfulness and seriousness he found in the work of Henri Matisse, an artist largely ignored at the time. Sutton’s tutors, who recognised him as ‘a gifted, intuitive painter’ introduced him to the dealers Roland, Browse and Delbanco who sold his first painting to Peter Pears and Benjamin Britten and continued to exhibit his work in Cork Street for the next twenty-eight years. At the Slade he met Heather Cooke. They were married in June 1953 and departed immediately to travel and live in Europe for over a year after he graduated funded by three scholarships including the Prix de Rome. After painting all the daylight hours for six months in the South of France he joined Stanley William Hayter who ran the famous Atelier 17 printmaking studio where Sutton learned his unusual woodcutting techniques through observation and experiment. Back in London, he took a part-time job teaching etching and lithography at the Slade and was rescued from living in one room in Kew, with their first son, by Peter Pears who offered them the use of the appropriately named Joy Cottage in Snape, Suffolk. They lived there for three and a half years and had two more children, Sutton developing his bright exuberant style through painting the Suffolk landscape while Heather made radio documentaries and a film. In 1958 they were able to buy a small house in Battersea where they had their fourth child, Rebekah. Sutton painted nudes almost continuously in this period with pale colours and delicate lines. They had many visitors. Pop Art and the American Expressionists caused turmoil in the art world in the early sixties and Philip and Heather Sutton headed out of London, for a year in Fiji, funded by the sales of his paintings. While he was away he became established as one of the British painters who epitomised the exuberant sixties. He returned with a full exhibition of tropical paintings and a film Heather had made about him. Heather took an anthropology degree at London University. In 1969 they bought a house in Falmouth and began to spend part of every year there painting expansive landscapes often including the docklands. 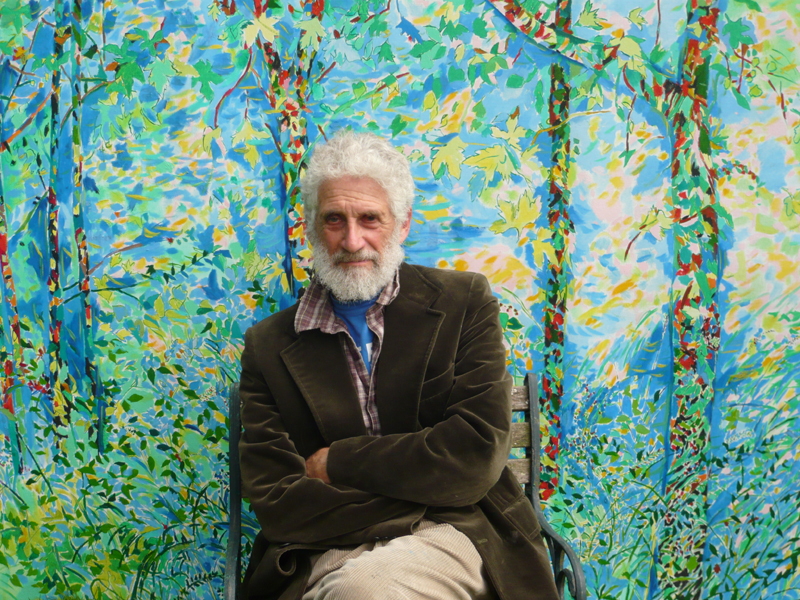 In 1976 Hugh Casson invited Sutton to become an RA and his reputation began to move beyond the art market. This led to commissions including designing a tapestry for Shell, a logo for 3i, the rose logo for the Labour party and wall tiles for the restaurant in a bank in Amsterdam. He also began to paint on ceramic pots. The owner of the famous Fulham Pottery commissioned him to make pots with Jean-Paul Landreau resulting in a successful Cork Street exhibition in 1987. He designed stamps for the Post Office, a poster for the London Underground and even crockery for the Royal Academy restaurant. A poster and the flag for the RA Summer Exhibition led the film director Sam Wanamaker to ask Sutton to design a poster for his proposed reconstruction of the Globe Theatre. Sutton became inspired by Agincourt, travelling to northern France to imagine the conflict and painting fantastical pictures reminiscent of Uccello. From 1995-97 the painting of the series was filmed in a television documentary ending with the paintings in the foyer of the Globe. The titles for many of Philip Sutton’s paintings are quotations from Shakespeare. It seems he loves and understands words almost as well as colour. In 1988 Sutton gave up teaching at the Slade and later they moved to Manorbier in Wales where they lived until 2014, when they moved to Bridport. Philip still paints every day expressing his appreciation of the world around him. The paintings in the exhibition are shown below. Please click on an image to see it larger with details. The paintings are in oil on canvas unless otherwise stated and all are framed. Frames painted by Philip Sutton are shown. To enquire about one of the paintings please phone 44 (0)1308 459511 or email: gallery@sladersyard.co.uk. Enjoy!! Hello, as a former student of Philip’s at the Slade (1985-86) I do hope that you will record his talk and post it here. I wish I could be there, but I live and paint in Mexico and cannot make the trip. Thank you so much for honoring his work and accomplishments! We’ll do our best! Watch this space… Many thanks for your message. Isn’t that a lovely piece in Artist. We will look forward to seeing you before 18 June. The paintings are even more amazing in the flesh. Hi, I came across a book of Philip’s work yesterday, on a flying visit to my local library- the work is ecstatic. My son who is studying A level art is thrilled too! We live some distance but will try and come to see the work. Thanks so much for your comment. We’ll hope to see you both here while Philip’s work is showing. Philip Sutton’s exhibition was wonderful. I loved the glowing colours and the drawing, and the woodcuts and ceramics. It was a joy to look at the world as he sees it. Thankyou, I hope you have another one in the not too distant future. Thanks. His paintings lit up the gallery. We will let you know when his work will be here again.